By Leah Seidl Howdy All! 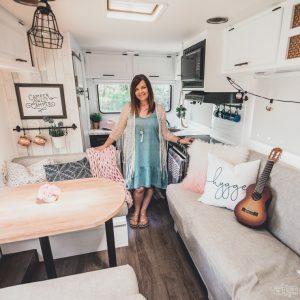 Leah here from Whimsical Elements stopping by for a quick visit! 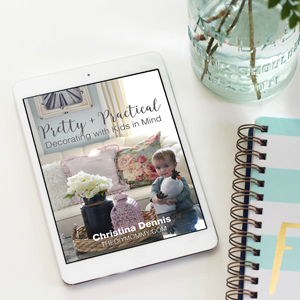 Ever lay awake in your bed at night, in a frantic sweat, just thinking non stop about making your own adorable hair accessories for your own little munchkins- or (let’s be honest ladies) yourself? Ever think “Oh, what I wouldn’t give to possess the know how to rock some awesomeness of my own??!”. Well look no further. Here I have compiled a straight to the point tutorial on how to make basic hair accessories. If you have a glue gun and some ribbon- you’re set! Oh YES, it’s TRUE!! I must forewarn you, that if you are overcome by a sudden urge to make hundreds of these little beauties for EVERYONE you know then I must say this to you : “With great crafty power comes great responsibility”. So without further ado. *Drum Roll Please* THE EASY PEASY HAIR CLIP TUTORIAL!!! Embellishments (Optional) these might include- buttons, appliqués, fabric, lace, macaroni noodles (just kidding- but you get the idea). Ready?????? Let’s get this party started!! Step 1. 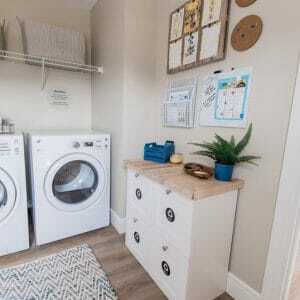 Take your ribbon of choice and cut off a nice clean end. 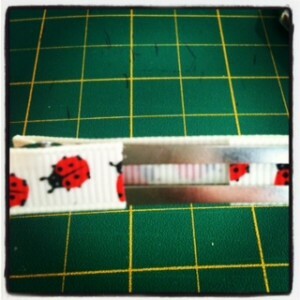 Then using either your lighter or liquid fray check- quickly seal off the end of the ribbon. This will help prevent fraying that will happen from wear and tear. Step 2. Take your alligator clip and pinch it open. Put the heat sealed end of the ribbon about 1/4 of an inch in between the top and bottom prongs. Step 3. 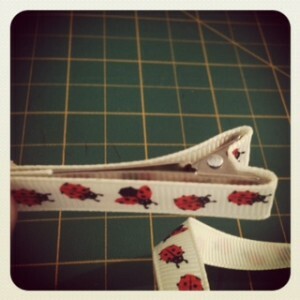 Now take your glue gun and apply a thin amount of glue along the top part of the clip. Remember to put a little blob on the top part of the ribbon that is exposed since you will be overlapping the ribbon on top and want them to create a nice seal. You will have to work relatively quickly since the glue will cool fast. IF that happens, no sweat. Just repeat the process- but beware because too much blobby glue makes for bumpy and uneven ribbon 🙁 Step 4. 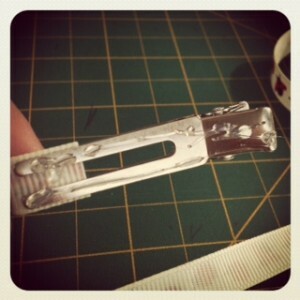 Now after applying the glue, gently smooth the ribbon over the top of the clip. Then put a small dab of glue on the clip end (top and bottom- where the spring is) and be sure to press the ribbon into there. Step 5. Now here is the part where you decide if you want a fully lined clip or a partially lined clip. Both work great, but depending on hair thickness, etc. it is 100% up to you and what you feel will stay in better. Fully lined clips tend to be a little bit tougher to insert into hair, but gives a bit more friction which can give a stronger hold. Partially lined clips slide in much easier and won’t break your hair – but can also come out more easily. ****A “non-slip grip” which is basically a teeny piece of foam or velcro or shelf liner or silicone that you glue to the underside of the top prong of the clip. 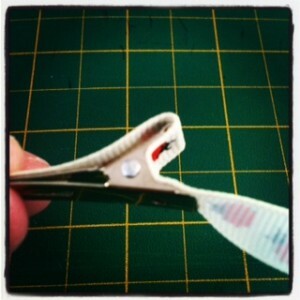 This again creates more friction helping the clip stay in more securely. Once more – personal preference and trial and error will help you decide. If you want a fully lined clip. Repeat the exact process as you did in Step. 2. Gluing and pressing and then finally cutting and sealing the ribbon end. 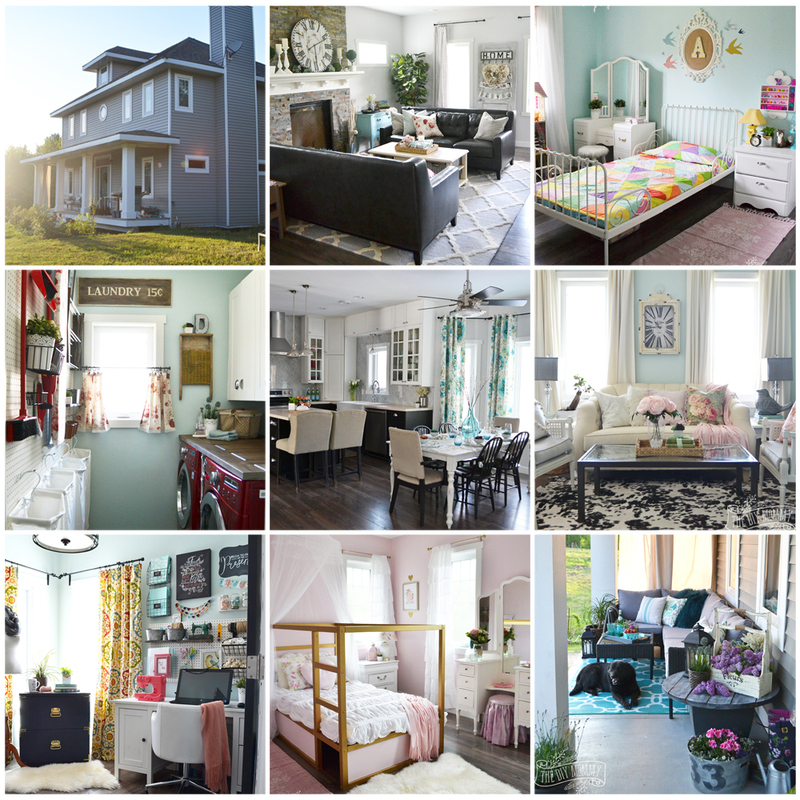 If you prefer a partially lined clip…. 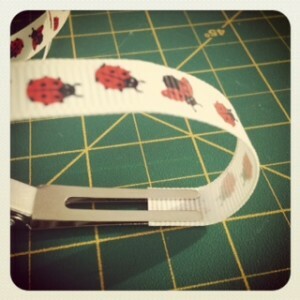 ….just cut and heat seal the ribbon before the opening on the bottom prong. Glue it down into place. FINITO!!! Now for the FUN part!! Step 6. …..WEAR THEM!!!! Or in my case, poke and prod my 3 year old into wearing what is likely the 7000th hair accessory of her life! See? EASY PEASY! 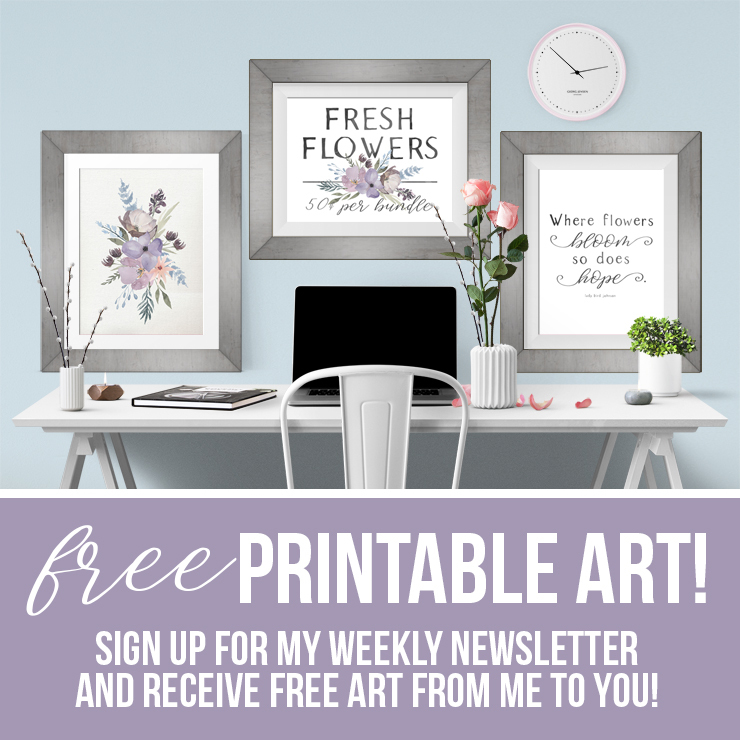 It’s been a treat guest posting for ya’ll!! Now go forth and spread some crafty CHEER! !